Nico Budi Darmawan Tan - Simple Outside, Complicated Inside. : Fight For Yourself, Nobody Will Do The Battle For You! Fight For Yourself, Nobody Will Do The Battle For You! This 2 week I was feel so sad. Something happen outside of my plan. To be honest, I don't like with some people related with how they deal with things surrounding them. In my side, I have tried to maintain good relationship and communicate well many times. I still don't understand and wondering that if they might be didn't get my message or they didn't want to hear my aspiration. Sigh...! I think the title of this post suit to become my another quote. 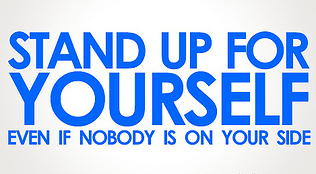 It will be much more complete with the picture : Stand up for yourself, even if nobody is on your side. Let me tell you the reason. Definitely, we have to do good things to people in order to get back good response too. But, hoping for someone will help you is very difficult in most battles. People will fight for their own first and personal thing come ahead. You have to be strong enough to endure at yourself first. Soon or late or maybe never the reinforcement will comes. Avoid rely on something uncertainty. In order to win, you have to fight or time will force you to lose. If finally they come, it will be better, but if they don't, you still will get a good result. Prepare your battle and fight for it!